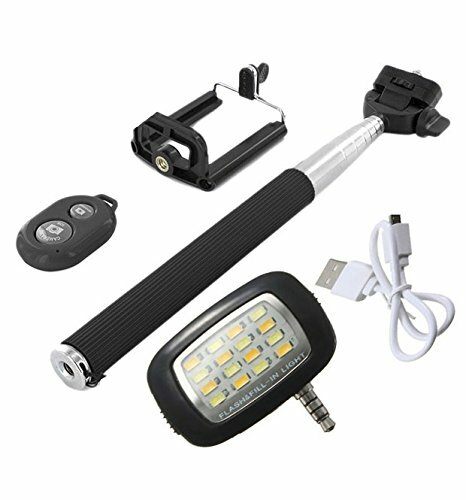 Novo Style Bluetooth Wireless Remote Shutter Selfie Stick - Black with 16 LED Selfie Night Flash Light Accessory Combo@396 Rs [Mrp:-860] - Onlinedeals.discount - A leading product discovery website. Find the true prices of products, read reviews and buy top brand products at reasonable prices. Led flash light Can be used independently as a lamp without conneting to any devices Brightness is adjustable. Novo Style bluetooth selfie stick is perfect for those impromptu snaps at dinner, on the train, our out at the club. Be sure to capture all of your memories with the Novo Style bluetooth selfie stick! By this pocket-sized bluetooth shutter, you will never miss any moment for group photos and selves as well.It makes everything much easy and it also means that you can fix the phone with a stand or tripod instead of holding it all the way. LED Light Improve photo’s quality when use camera in poor light situation Built-in rechargeable battery, won’t consume your device’s battery Can be used independently as a lamp without conneting to any devices Brightness is adjustable. Provide three powerful lighting model to meet the needs of the different scenarios. Photo and video mode available. Comes with built-in rechargeable battery. Uses 3.5mm audio jack.